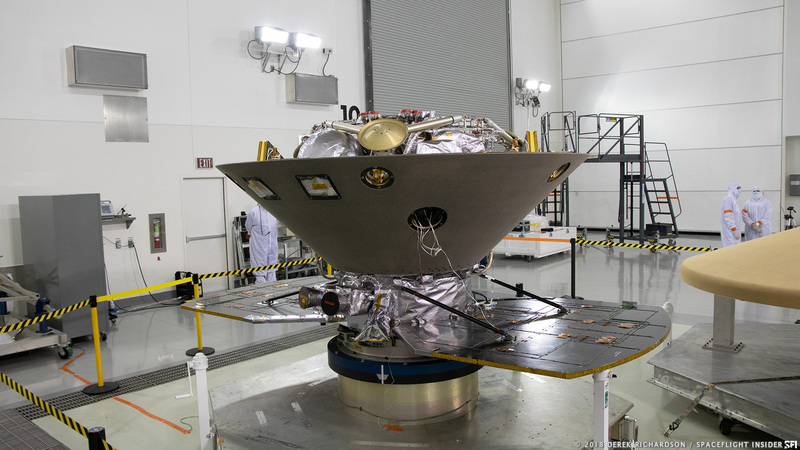 LOMPOC, Calif. — NASA’s InSight Mars lander is less than four weeks away from its planned launch to the Red Planet. The spacecraft is currently undergoing final preparations in a clean room at Vandenberg Air Force Base before it will leave Earth atop an Atlas V rocket in early May 2018. Short for “Interior Exploration using Seismic Investigations, Geodesy and Heat Transport,” InSight is designed to study the inner-workings of Mars. The spacecraft is currently targeting a launch at the beginning of a two-hour window opening at 4:05 a.m. PDT (7:05 a.m. EDT / 11:05 GMT) May 5, 2018. 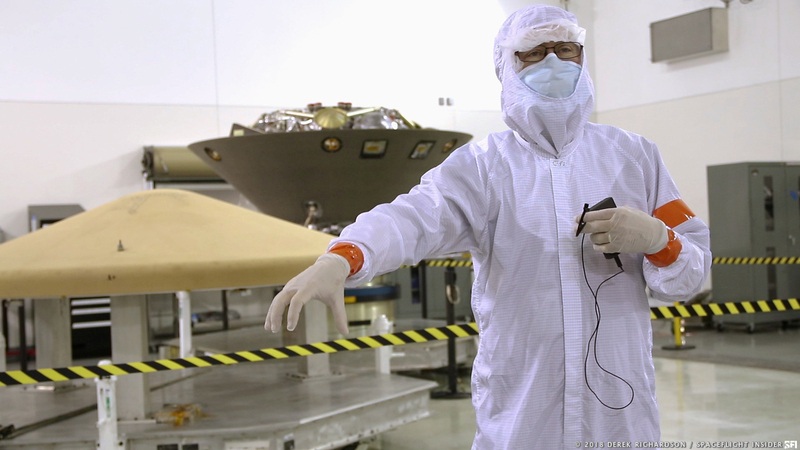 NASA said this will be the first interplanetary spacecraft to leave Earth from the West Coast. 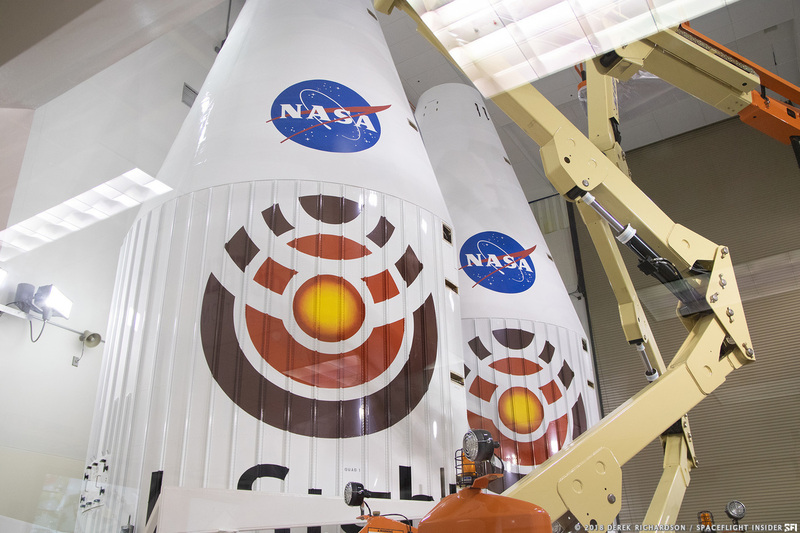 It will launch atop an Atlas V rocket in a 401 configuration (meaning it has a four-meter payload fairing, no solid rocket motors and a single-engine Centaur upper stage) from Space Launch Complex 3E at Vandenberg Air Force Base in California. 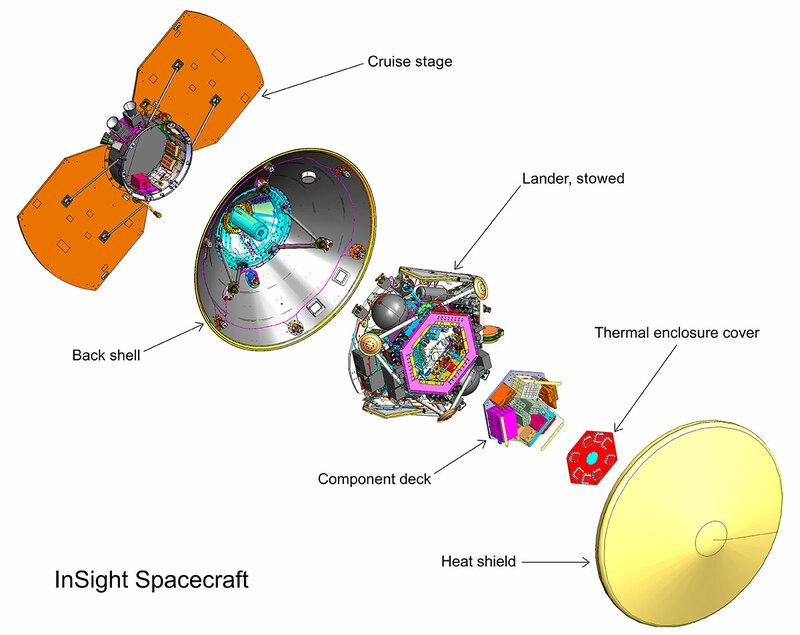 During the launch and cruise phases of its journey to the Red Planet, the InSight lander is tucked inside an aerodynamic back shell and protective heat shield. 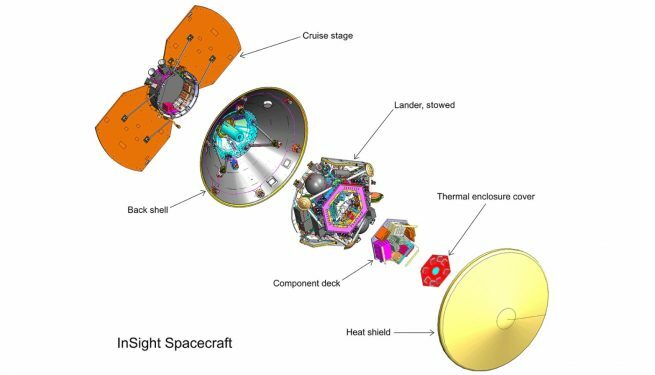 Behind the back shell is a cruise stage that includes solar panels for power, radio antennas to send and receive data, and thrusters for propulsion to be used for various course correction maneuvers along its nearly seven-month-long trajectory. Once on its way, InSight will target a flat plain near the Martian equator called Elysium Planitia. Landing will occur around 3 p.m. EST (20:00 GMT) Nov. 26, 2018. “[InSight] is going to go to Mars to probe the deep interior of the planet so we can understand how rocky planets form and understand the history and processes that have shaped Mars,” Bruce Banerdt, the principal investigator for the InSight mission, told SpaceFlight Insider during an April 6, 2018, media event. 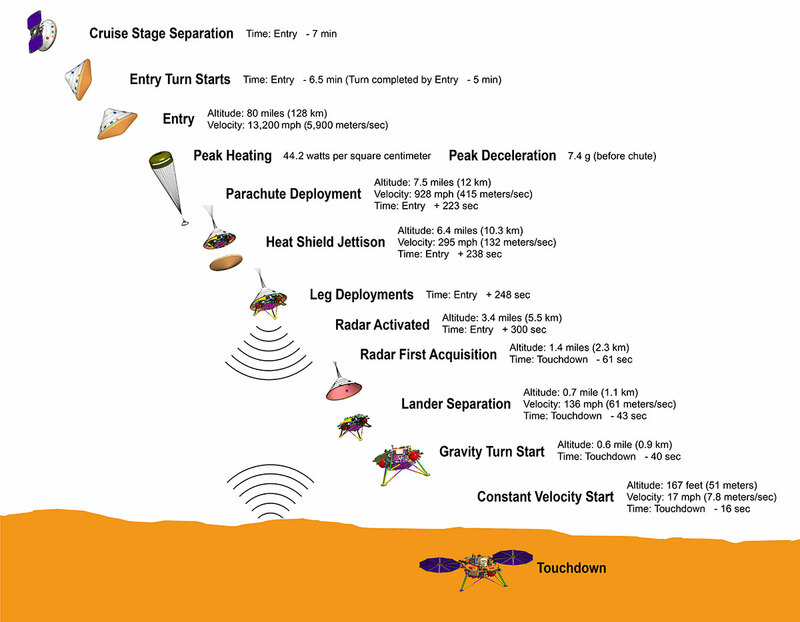 Based on NASA’s 2008 Phoenix lander design, the 794-pound (360-kilogram) InSight lander has a science deck height of about 33 to 43 inches (83 to 108 centimeters), according to the mission website. The science deck’s diameter is just over 5 feet (about 1.56 meters). With its two 7-foot (2.2-meter) diameter circular solar panels deployed, the total spacecraft length comes to about 20 feet (6 meters). “One of the cool things of this mission from a spectator standpoint is we’re going to do something for the first time, which is use a robotic arm on the spacecraft to pick up instruments off the top of the spacecraft and actually place them on the ground,” Banerdt said. The instruments being placed on the surface include a seismometer and a heat flow probe. Banerdt said the instrument called Seismic Experiment for Interior Structure (SEIS) will be placed onto the surface by the lander’s eight-foot (2.4-meter) long spacecraft arm and be used to determine the interior structure of Mars, such as the thickness planet’s crust, and the size and density of its core. “[SEIS] is our main instrument and that’s really the thing that gets us the most detailed information about the interior of the planet,” Banerdt said. A second instrument, the Heat Flow and Physical Properties Package (HP3), will also be placed on the surface of the planet. “It’s a heat probe that has a hammering mole that digs down 15 or 16 feet below the surface and measures the change in temperature as you go down those 16 feet and we extrapolate that temperature increase all the way down to the center of the planet to understand the heat budget of the planet and the vigor of the geological engine that is shaping the surface,” Banerdt said. It will take about two months for the two instruments to be placed onto the surface. Then, the two-Earth-year science-gathering mission will begin. In addition to those instruments, there are other instruments, Banerdt said. This includes a weather package that measures atmospheric pressure, temperature and wind at the landing site. He said there is also a magnetometer that measures the magnetic field in the area. Additionally, a radio science instrument called Rotation and Interior Structure Experiment, or RISE, will look into precisely measuring the Red Planet’s rotation using X-band radio waves, according to NASA. It is hoped the data gathered will allow scientists to determine whether the planet’s core is liquid as well as what other elements, aside from iron, may be present. 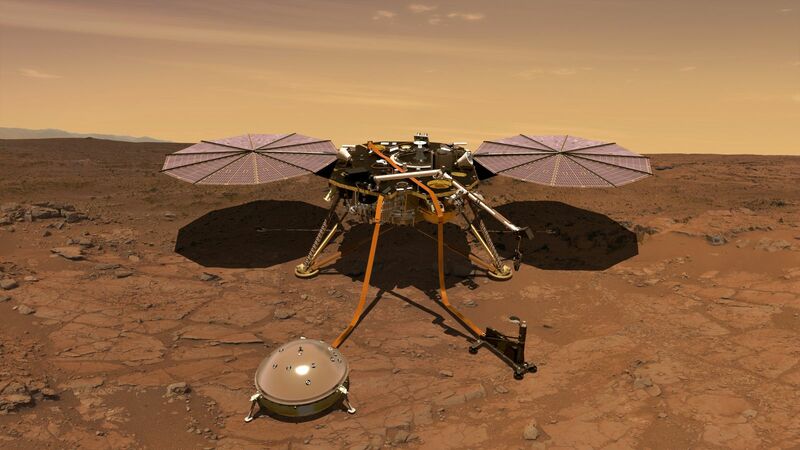 InSight was built by Lockheed Martin Space Systems and is managed by NASA’s Jet Propulsion Laboratory. The mission was selected in August of 2012 as part of NASA’s Discovery Program. NASA’s budget for the mission was $675 million. Originally targeting a launch in May 2016, the mission was postponed after a persistent vacuum leak in the SEIS instrument was revealed. NASA later said the delay would cost an additional $153.8 million. The instrument had to have a new thermal enclosure designed and built. After the final tests of the spacecraft were completed in early 2018, the vehicle was shipped from its assembly location in Denver to Vandenberg Air Force Base on Feb. 28, 2018, via a C-17 cargo aircraft. From there, it was delivered to the Astrotech Space Operations clean room at its facility on the base. Linn said that during the week of April 9, the mission team would put on the mission’s heat shield for the last time before it gets to Mars. After that, the spacecraft will be integrated into the Atlas V launch vehicle, which has already been stacked at the launch pad. The InSight team chose the West Coast to launch the spacecraft primarily because the launch traffic is much lighter compared with the East Coast at Cape Canaveral Air Force Station and Kennedy Space Center. Linn said mission managers wanted to maximize the opportunities for launch and the Atlas V 401 rocket’s performance could easily support launching InSight toward Mars from either coast. While the opportunity to launch to Mars extends through June 8, 2018, no matter when it gets off the ground the spacecraft will still arrive at the Red Planet on Nov. 26, 2018. That’s when atmospheric entry, arguably the most dangerous part of the mission, will occur. It is a period known as “the seven minutes of terror” by the mission team. “It’s seven minutes where everything has to go right,” Linn said. “We come in at about 12,500 miles per hour and at that point we need to slow the spacecraft down as it enters the Martian atmosphere all the way to about five miles per hour when it finally touches down. Linn said the landing process involves a series of events that has to happen perfectly. This includes using the heat shield for the first 3.5 minutes to slow the vehicle down to about 1,200 mph (1,900 kph). Then a parachute will deploy to stabilize and slow the craft even further to about Mach 1.65. 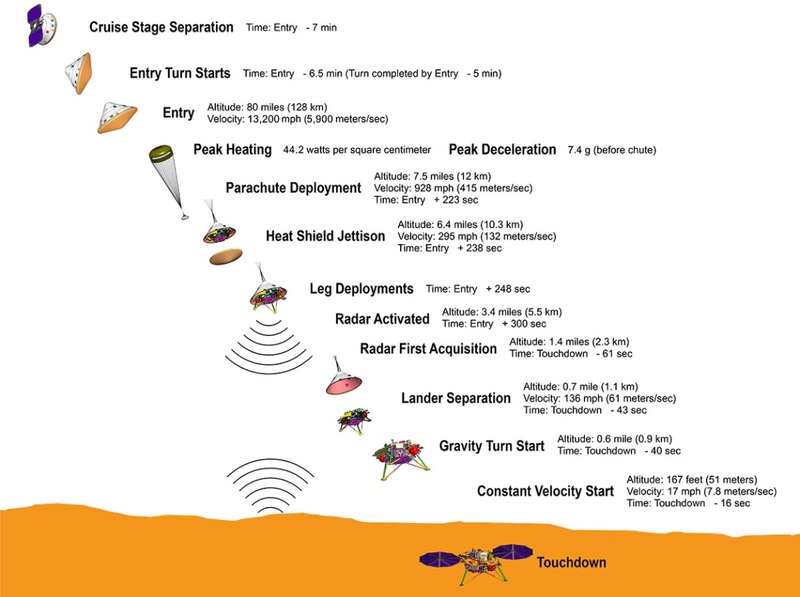 After the heat shield is jettisoned and InSight’s three landing legs are extended, the spacecraft will separate from the protective back shell and use 12 descent engines to propulsively land on the surface.